A while back I wrote about the death of the phone booth in Paris, but it seems like I underestimated its durability. This picture here shows a prototype model of what could be the future face of the payphone in the city, but is it a pretty one? 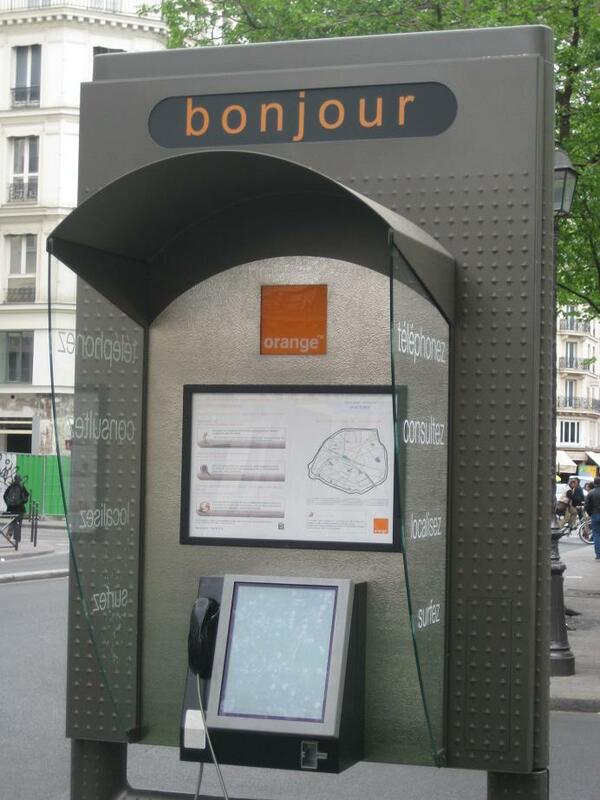 The city of Paris is looking to replace its ageing fleet of phone booths, and asked Orange (France Telecom) and JCDecaux to work on potential new models. The two companies presented a prototype to the design bureau at the City of Paris, and have been allowed to install 12 test models around the city for a 6 month period (the one caught on photo here is on the Rue de Rivoli next to the St Paul Metro station). 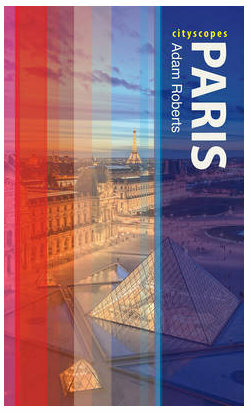 The City of Paris website has described the design as being 'very futuristic', but I think 'very dull' would be more suitable. JCDecaux, the company behind the Velib system as well as many public toilets and most bus stops, is slowly defining the new norms of street furniture (a kind of grey/brown! ), and clearly the company has only one goal - maximise advertising space. This design eliminates all trace of the traditional private box model, and is in fact little more than an advertising panel with a phone on the back. The new prototype alongside a more traditional Wallace fountain. What about the phone unit itself? Well, this is more revolutionary, with a 17 inch screen and full internet connectivity, meaning users can now not only make phone calls, but also profit from 10 minutes of free internet access. A GPS system has also been installed in the unit to give information on local services, such as transport, cinemas and restaurants. Two things strike me here. I hope that 17 inch screen is made from some very heavily reinforced glass because it looks eminently breakable. However, even if it is indeed unbreakable, I'm sure it will be regularly scratched and tagged. Secondly, in such a public space, will anybody dare to use it to check their e-mails? In an age of smart phones and ubiquitous wi-fi connections, I'm not sure that it is something that city dwellers need today, but JCDecaux will not mind about that. 5299: the number of phone booths in Paris, which is equivilent to one phone for every 400 inhabitants. 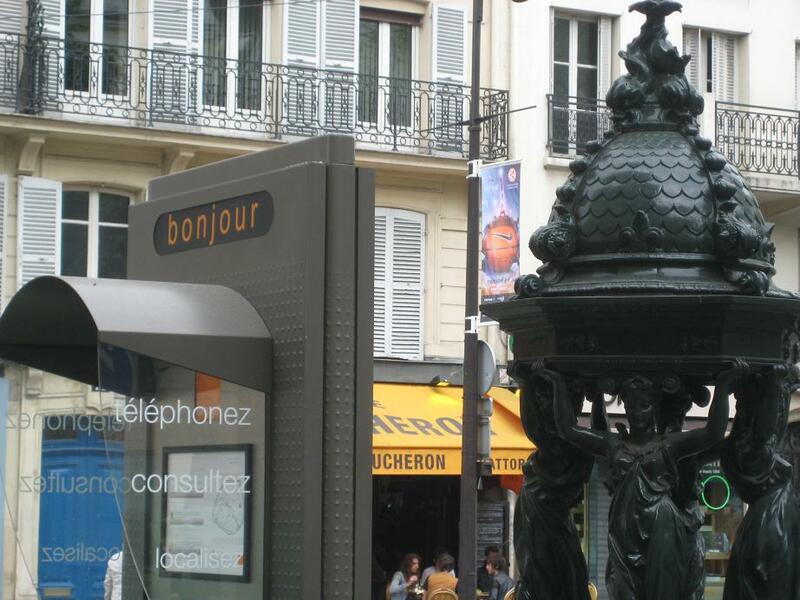 1 million: around 1 million people use public phones in Paris (7 million people throughout France). 50 minutes: the average usage of a phone booth each day in Paris. 60%: the percentage of payphone users who also own a mobile/cell phone. What do you think? Do you like this design and would you use it? When did you last use a public phone? Unless someone had the lack of respect to stand and watch what I am doing, I would have no problem using one of these to check my email. Interesting. Where you see lack of privacy, I see economy of space - it seems very unobtrusive, which seems like a good quality. I agree with ArtSparker; I like the unobtrusive nature of it. it doesn't provide much in the way of shelter or noise protection, so i don't think anyone will want to have a very long conversation. I guess my photos make it look more attractive than I found it to be, as it seemed really large and bulky to me. Secondly, with a 17" screen, nobody needs to stand and watch to see what you're doing, especially in such a busy place as this (Rue de Rivoli). Of course it lacks the charm of the British phone booths. Let's give it a chance! I propose you go back here after the trial period! I'm right with you on that one. And yeah, your pictures make it look nicer than it is (I happen to walk by the one to shot almost daily), it's an ugly piece, that nobody will use, except maybe tourists, and that has a very short life expectancy. "the one you shot" not "to shot"
Decaux pourrait se servir de l'écran pour afficher une pub ?! Ce sont les usagers qui feront le succés ou non de cette opération. Après avoir essayé en vain de téléphoner depuis une cabine publique pourtant située en face d'un hôpital, après que dans le dit hôpital on m'ait dit qu'il n'y en avait pas à l'intérieur, je suis allée chez un commerçant dans la rue qui met à disposition des cabines comme faisaient autrefois les bureaux de poste (je ne sais si cela est toujours). Mais ce commerçant bien entendu n'est ouvert qu'aux heures ouvrables. Ceci fut ma dernière tentative. J'ai fini par acquérir un téléphone portable qui me rend quelques services, je l'avoue, et surtout permet à ma famille de me "fliquer". Non ce dernier point est injuste, d'ailleurs mon téléphone ne sonne jamais. What I don't get is that it appears to have a greeting above it rather than a description of what it is, i.e. it says "bonjour" (note fluffy lowercase letters) rather than "TELEPHONE" like in the old days. I reckon that's the fruit of hours of brainstorming in some marketing department, with a lot of people pointing out that "Telephone" was just too restrictive because it does sooo much more than that. What next? "Awright?" on letterboxes? This looks anything but unobtrusive to me. It may not be brightly-coloured (although presumably the back will be when it's plastered with adverts), but it's huge! That's a lot of street clutter, and a lot of the streetscape blocked from view. Being tech savy, I must wonder who would spend time/money on public phone when mcDonald's has free wifi. Being American, one thing comes to mind... free passwords anyone?